In response to all the calls we are getting because of our current COLD temperatures, we offer these tips to avoid frozen pipes! 2. Pipe insulation. In areas of the home that aren’t heated, like the attic, garage and crawl space, install inexpensive pipe insulation that will protect them in moderately cold weather. More extreme cold temperatures require thermostatically controlled heat tape, which will activate when the temperature drops too low. 3. Open kitchen and bathroom cabinet doors. This allows warm air to circulate around the pipes, preventing them from freezing. Do this if you’re going on vacation during the winter months as a precaution. 5. Use a space heater. If you have an area with unprotected pipes, you can use a space heater. The heat doesn’t need to be running full blast, just warm enough to prevent the pipes from freezing. This is more of a temporary solution until the pipes can be properly insulated. Use safety precautions. 6. Have someone check your house if you’ll be gone for an extended time. Nothing is worse than coming home to a flood because of a burst pipe. If possible, have a trusted neighbor, friend or family member check on your house every so often, especially when the temperature really begins to drop. 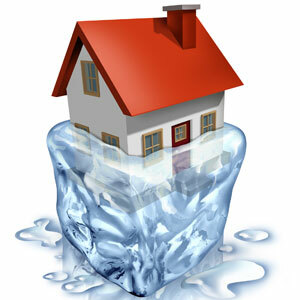 The best way to deal with frozen pipes is to prevent them from freezing in the first place. Most of these tips are easy to do and relatively inexpensive. We are in the midst of an arctic cold period, but you can still prevent a problem by acting now.